Well I should be in front of the telly or down the pub watching tonight’s game but with a very early start with yet another rugby fan in the morning I thought I would take some time to touch base with you guys. The atmosphere around Taupo has been electric with rugby fans adding something special to the air while they see the attractions that NZ has to offer. 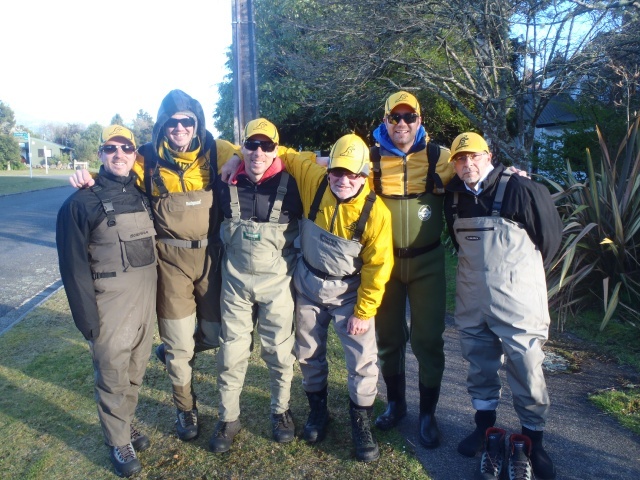 Their enthusiasm and happy faces have been welcome on the rivers this week with many of them using guides to see some of the best fishing which the world has to offer. Ok, I know the locals probably are not keen on seeing guides on every corner or in every car park but these guys wont be here for long. All rugby fans are in high spirits and are great guysÂ so make sure you go out of the way with some friendly banter. The fishing on the Tongariro over the past ten days has been justÂ great with most anglers catching some very impressive fresh run fish which are well over theÂ 3lb average. The lower river has been hot most mornings but so has the foot trafficÂ so it would be worth pushing up river to avoid crowds if you dont like them. With very little angling on the upper river those who have fished high have done very well with one group of anglers landing over 30 fish Saturday afternoon in the Sand pool. Small naturals have done well in the upper river during the day but I will still fish glo bugs for the first couple of hours in the morning only switching when the catch rate drops. I must admit I have been swinging the odd wet fly which has usually produced some nice hard hitting fish through out the braids and lower river.Â Orange Rabbits, RedÂ SettersÂ and Woolly Buggers proving lethal when swung in the right direction. Wet lining has made a hell of a come back over the past 6 months and is now once again becoming fashionable. 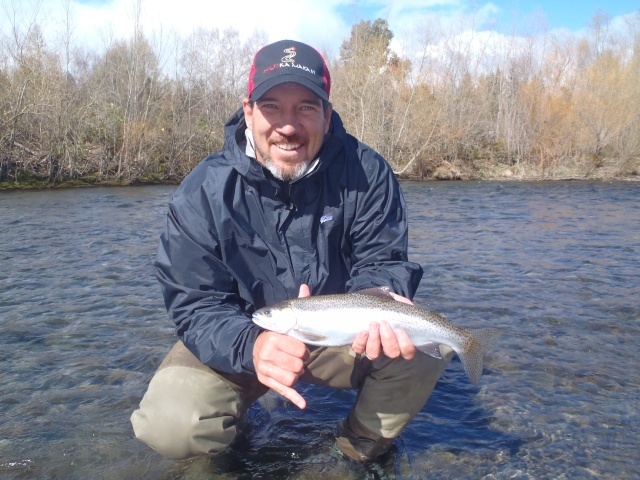 The Tongariro is not the only river which has fished wellÂ and anglers should not forget the river mouths and rivers such as the Hine and Waitahanuie especially on the dark nights with no moon at the moment. 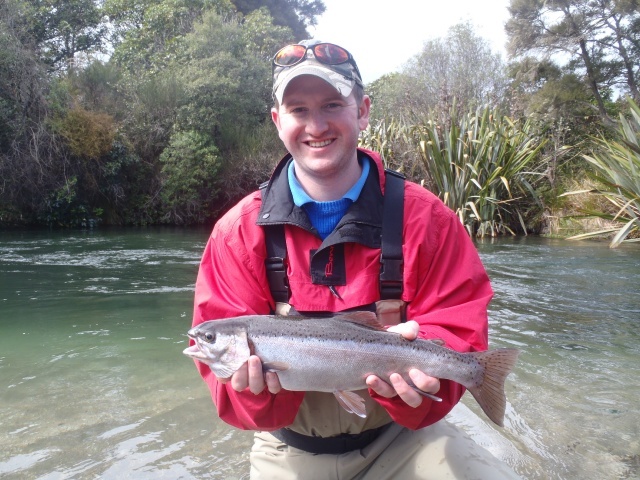 I have been guiding on the upper Waitahanuie and caught fish on most occasions both nymphing and wet lining. 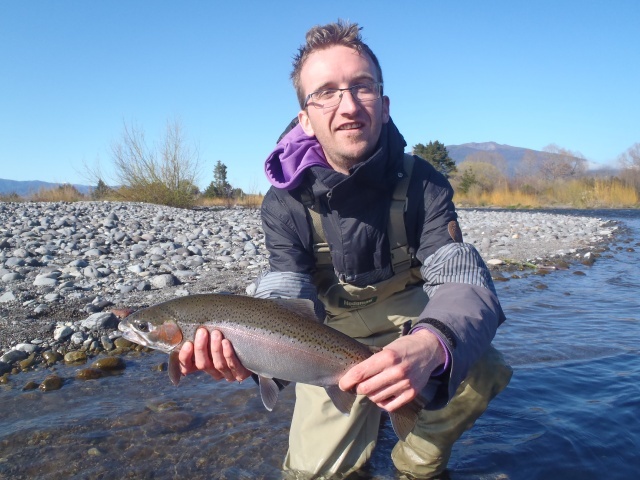 Last weekÂ I guided Josh to a lovely 9lb rainbow which he and I will remember for a life time.Â If I can catch fish in here you can, so don’t overlook this option if you are sick of the crowds on the Tongariro. The Hine has good numbers of fish up high but many have done the spawning thing and are now looking a little tired and ready to head home. A few fresh fish are still pushing in but the runs have slowed in this river but with rain forecast tonight this may just be enough to triggerÂ a few late runners which should be targetted somewhere below the bridge early. Anyway another full week of guiding ahead which is just fantastic. All in all fishing is pretty good but you wont be the only one enjoying what Taupo has to offer.